Deluxe Solar Bear Above Ground Solar Heating System is manufactured by Fafco who are one of the premier companies in the solar industry. The all new Solar Bear Heating system is super efficient and long-lasting. Extra large 2 inch headers do not slow down your pool's circulation and insure excellent solar heat transfer to your pool's water. 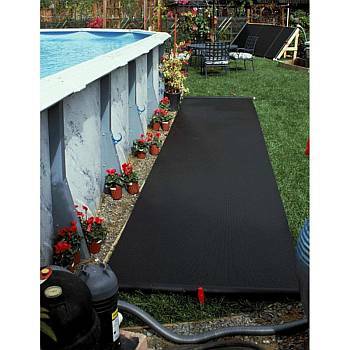 Because of the large 2 " headers, rarely is more than one panel needed for most above ground pools. This above-ground solar heating system will raise your pool's temperature 10° or more using the sun's free energy. When used in conjunction with a solar blanket, it is all the heat you will need - no expensive heater to buy and maintain, and no costly gas bills. Extend your swimming season without worrying about the ever increasing cost of fuel and energy bills. Solar Bear Deluxe Solar Panel Add On Kit comes complete with a coupling kit, so you can connect the panels together. Solar Bear panels can be mounted on the ground, on a rack, or a nearby roof. Easy to install, each system comes complete with installation and user's manual and is backed by a 10 year warranty. Put free solar heat to work for you this season with the best above ground pool system on the market and swim in a warmer pool without the huge expense of heating it.